Schruns, located in Vorarlberg, the most western part of Austria is a paradise for winter adventures like snowshoeing, hiking and skiing. Besides snowshoeing, Schruns also has a fantastic selection of trails for cross country skiers and winter hikers. It’s also a great place for beginner skiers, with 5 ski resorts all within a 7km radius. In sum, Schruns is a paradise for winter adventures. I found out about Schruns, Austria by accident. I was itching to get in a weekend of snowshoeing but really didn’t know where to go that was reasonably close to Stuttgart, where I was living. At that point, I hadn’t been to the Partnachklamm in Garmisch-Partenkirchen or the Hoher Kranzberg in Mittenwald, both in the German Alps. I had heard the Montafon Region in Austria, which includes 3 mountain ranges was a good place to go skiing. And where there’s skiing there’s usually snowshoeing. I checked the snow report and they had just received a dump of snow. It looked liked as good as place as any to start my snowshoeing adventures in Europe. Schruns is a small village of 3800 people in Vorarlberg in western Austria. It’s surrounded by mountains and lies 500 km west of Vienna and ~250km south of Stuttgart. You’ll need a car to get around easily. You can often rent one for rather cheap. I do this a few times a year when I’m heading to the mountains in Austria. Our first stop was the tourist office to get a map of snowshoe trails. Snowshoeing isn’t extremely popular in Europe so I was curious to see how many routes there were. Fortunately, around Schruns we found that there was a good selection of snowshoe trails and “winterwanderrouten” (winter hiking trails). The winter hiking trails can also be accessed on snowshoes, it just takes a bit more work. We got really lucky and the lady who helped us at the tourist office was also a skier. We took her up on two of her recommendations since there were so many to choose from. If you’re going to an area that you don’t know, ask the locals for their recommendations. I love doing this on Twitter – that’s how I ended up finding snow during a dry season on the Hoher Kranzberg. Enjoying the view at Bartholomäberg. The first day we started off in the Bartholomäberg region, just a few kilometres from Schruns. Bartholomäberg won’t be making my list of favourite snowshoe trips anytime soon. A good portion of the 9km trail we did was near cabins. In between the road that worked its way up the mountain in a zigzag fashion. Stopping at each road intersection and checking for cars is not really my idea of getting away from it all. We did have nice views along the way though. After a good two hours of too much civilization, we got into the woods. This was more along the lines of what I consider snowshoeing. Three hours of huffing and puffing later, we reached a mountain hut that was closed until the next week when the busy season started. It was a good thing we had packed plenty of food and water. I was starving. The view did not disappoint. We hungrily wolfed down our food and peeked inside the windows of a very small church. The good thing about the Bartholomäberg region is that once you get up past all the civilization, the views are superb. There are lots of options should you wish to extend or shorten your snowshoe. Having said that, I was anxious to see what other types of snowshoeing were available near Schruns. The next day, we found ourselves at the Silbertal Ski Area, just a short drive from Schruns. We arrived at a gondola and waited among an eclectic group of downhill skiers, cross country skiers, winter hikers and two other snowshoers. I wasn’t overly optimistic. How was one mountain going to accommodate all these different activities without us crashing into each other? Our chosen trail also didn’t do much to inspire confidence. It started at the bottom of a downhill ski run. We cautiously trekked up the side of the trail. I was rather wary of newbie downhill skiers who were going to crash at any moment and take us down with them. Fortunately, that didn’t happen. After a few tense minutes, we found ourselves alone on a snowshoe trail that looped around the top of the mountain. This was a real snowshoe! Loved the snowshoeing at Silbertal on the top of the mountain, very peaceful! An hour later and we still hadn’t seen any other people. That’s my idea of getting away from it all. We made our way to the first viewpoint. It overlooked the backside of the mountain and had a small valley before leading up another mountain range. Spectacular! We continued on, but the path didn’t. We made our way in knee-deep snow, our pace slowing down considerably. Making your own snowshoeing path in knee deep snow is hard work, but great exercise! We did this for another hour or so before my bum knee finally demanded we turn around. I was now in pain, but still so happy to have found a “secret” place. It turned out not to be so “secret” as we met several other snowshoers on our way back. They were all very cheerful, thanking us for making the path so that it was easier for them. By the time we got back to the chalet, just near the gondola, we were starving so stopped for a bite to eat. We savoured the view one last time from the gondola. My partner started planning our return trip while we were still on the gondola. I took that as a good sign that he had enjoyed our weekend of snowshoeing in Schruns, as much as I had. Breaking trail on Silbertal was hard work, but I loved every minute of it! Due to its relatively low elevation, it’s a good idea to check the Snow Report before you go. 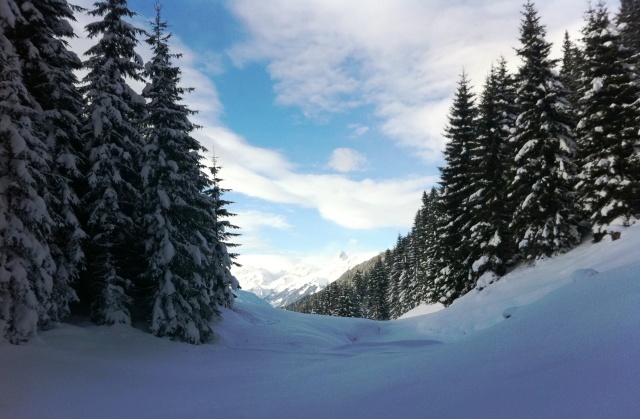 For more info see the Montafon Tourist Info Site. I would also highly recommend stopping at the Schruns Tourist Office. You can pick up the free “Aktivkarte Winter” in English, “Winter Activities Map”. The map is only available in German but it shows where the different trails are and how long they are. It’s useful and relatively easy to use even if you don’t speak German. You may also get lucky as we did with the tourism information lady being a skier. I love tips from lucky. Check Booking.com. I always use this site when booking my accommodations. I love having lunch in mountain huts but check that they’re open first. Many of them are only open seasonally. You can ask at the tourist office which huts are open and which ones they’d recommend. Looking for more adventures in Austria? Check out what you can do in Zillertal, Austria and in Grossarl, Austria. This article was originally published in Feb 2011 but was updated and republished in Jan 2019. These are awesome photos, Laurel. I'd like to get over there and put on some snowshoes myself. I've not actually snowshoed before, but I enjoy skiing (mostly downhill, a little cross-country) and would like to try it. It seems like fun and great exercise. @Cathy - You should definitely try it. I love it since it's just like hiking, no skill required, so anyone can do it and I think it burns something like 800 calories an hour as well! @Jillian - The temp was only -5C so it wasn't too bad and after about 10 minutes, we were sweating. I can see why your friends are trying to get you to try it, it's a lot of fun and much, much easier to learn than skiing. @Julia - Really? I guess there's not a lot of snowshoeing in England :) It's great for anyone of any age and a lot like hiking, so you're never going out of control as sometimes happens with skiing. Hope you get the chance to try it one day. @Robin - I agree, anytime I'm out in nature, I feel all my stress just disappearing. Laurel, What a beautiful view...there is something about snow that makes me smile. I don't necessarily like being in it, because I am a wuss when it comes to cold weather. However, I love seeing snow in photos/movies, etc. I learned a lot about snow shoeing too. Very informative post! Wonderful photos, Laurel. I am looking forward to snowshoeing here in the Rockies when my course is completed. Note to Cathy. Best not to turn the head and talk to someone behind you when snowshoeing forward. It is an incredible experience and easy to learn. A couple of face plants later you will be fine. @Barry - Thanks and while I love snowshoeing in Austria, it's not the Canadian Rockies. LOL regarding the comment about face plants, it's true, you do it once or twice, then you're good to go! I've only been snowshoeing once (in the Rockies, so beautiful!) but this looks amazing. At first I hated the snowshoes but once I got the feel for them I really enjoyed it and am hoping to get out again this year! I've never done snowshoeing. Schruns seems like a perfect place to do so though! Excellent - I was looking for somewhere close to Stuttgart for us to take out the snowshoes again. My daughter is itching to try hers for their first winter! Wow your pictures are really lovely. I can see that Austria is a fantastic place to ski together with my family. I would love to do these great activities with my family. Branson Missouri is also famous for mountain hiking. These are one of the great activities I am looking forward to spend with my family on our upcoming vacation. Thanks for sharing!